A custom closet by Boston Closet Company can completely transform your walk-in closet or expand your existing closet space. Our team of experts will work with you to determine what you need most in a closet. By looking at your current situation, we’ll understand how you use your space. 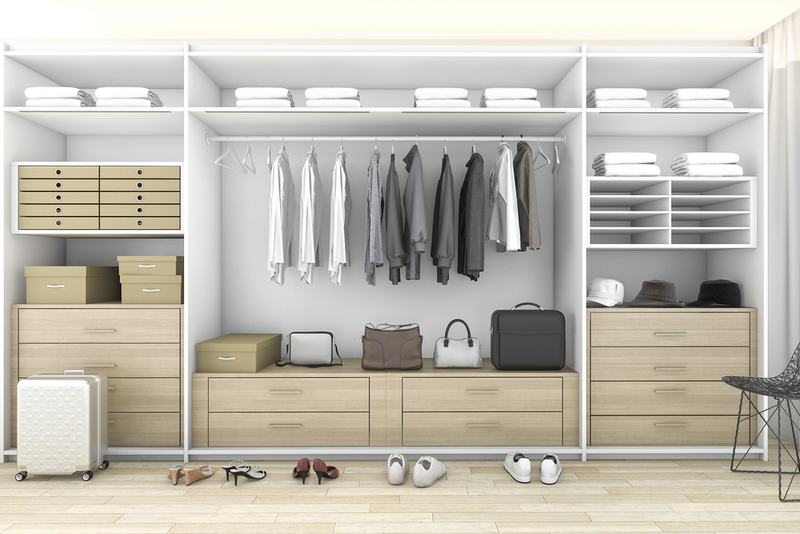 Whether you need more room for clothes or desperately need a way to store your shoes, we can help. There are a lot of decisions to make when designing your custom closet, but there are five walk-in closet essentials you should consider first before adding anything to your space. This accessory is one of the first things you should consider adding to your custom closet. We are all guilty of splurging on shoes, but don’t have a proper place for them other than on the floor of our closet. A built-in shoe rack will not only clear up space on your floor, but will also display your shoes for easy access to whenever you need them. Jewelry is a way to make a statement with your outfit every day. Let it make a statement in your closet, too. With velvet lined drawers, you can lay out every piece of your jewelry collection to see which items match your outfit for the day. We also offer a locking version of these drawers to ensure sentimental pieces and family heirlooms are secure. Another popular feature to display jewelry is an island installed in the middle of the closet. This really draws the eye in and become the focus of the space. An island also offers additional drawer space for accessories like belts and ties. Add a built-in bench at the end to make getting ready a snap! Fold away mirrors are a real space saver, which makes them perfect for smaller walk-in closets. A floor-length mirror is essential for seeing your full outfit before leaving the house. Fold-away mirrors can slide in and out of built-in cabinets so they are completely hidden when not in use. Another accessory that you’ll definitely want is a built-in laundry basket. Get two to sort your dark and light laundry easily. Laundry baskets are typically an eyesore; they sit out in the open for all to see. With built-in baskets, they fold into the surrounding shelves to seamlessly blend in with other cabinets and drawers. This will keep your dirty laundry out of sight and make it easier to sort once laundry day rolls around. For added comfort while getting ready, our designers can add built-in seating to your cabinets or build out space for a luxurious chaise. Comfy benches make your walk-in closet feel like another room of the house, rather than just a storage space. Walk-in closets have come a long way in recent years. Boston Closet Company can help customize your walk-in closet to your exact specifications so you’re sure to get the most out of the space. Visit our website to see the other accessories available to you for your walk-in closet.